GIS Dossiers aim to give our subscribers a quick overview of key topics, regions or conflicts based on a selection of our experts’ reports since 2011. This survey reviews GIS experts’ analysis of the Trump administration’s economic policies. United States President Donald Trump’s economic policies have confounded economists and angered many even within his own party. His protectionist rhetoric has alienated allies, and his tax legislation has been the subject of withering criticism. Yet, 18 months into his administration, the U.S. enjoys low unemployment and strong economic growth. The disaster many predicted has not materialized – at least not yet. That’s not a surprise for GIS readers over the past year and a half. Our experts’ analysis of “Trumponomics” indicated potential benefits and pitfalls, but without the high-pitched alarmism of many international media. The Trump administration’s economic policies have received plenty of criticism. However, in April 2017, GIS founder Prince Michael of Liechtenstein urged taking a coolheaded, balanced view of the administration’s proposals, and concluded that Trumponomics deserves a second look. He pointed out that criticism of Chinese trade practices was something previous U.S. presidents had engaged in, and that trade agreements like the Trans-Pacific Partnership (TPP) and the Transatlantic Trade and Investment Partnership (TTIP) had many protectionist measures embedded in them. Reducing corporate taxes, slashing regulatory costs and encouraging investment are all worthy goals of the Trump administration and a refreshing change from previous administrations’ policies, Prince Michael wrote. He concluded that the outlook for globalization is “far from hopeless. Progress on lifting barriers to trade and capital may perhaps slow or even stall in the face of geopolitical turmoil. … Yet the global economy is expanding at a significant rate. … The better off the world is, the more difficult it will be to kill off the source of its prosperity” – that is, robust international trade. Of course, President Trump did erect some barriers, and new tariffs on steel and aluminum imports (25 percent and 10 percent respectively) caught the most attention. GIS Expert Dr. Emmanuel Martin warned that the Trump administration was making a mistake akin to the Smoot-Hawley tariff of 1930, which many economists claim had disastrous effects. Playing off a high-profile statement President Trump had made on Twitter, Dr. Martin reminded him that trade wars are bad, and nobody wins them. “The simplistic mindset in which ‘exports are good, imports are bad’ is wrong,” he wrote. In the end, putting up barriers to trade risked retaliation, an increase in economic nationalism, and ultimately, lower global economic growth. Professor Colombatto also pointed out that President Trump’s success in implementing such barriers could turn out to be a Pyrrhic victory. Reducing the trade deficit with countries like Japan and China would ultimately strengthen the dollar, making American exports less competitive and imports cheaper. “So back to square one, with a widening trade deficit,” he wrote. GIS Guest Expert Derek Scissors posited that President Trump’s protectionist initiatives would not have as big a negative economic impact as some thought, since the U.S. does not suffer from slow growth, innovation or consumption. “Where inequality is high, economic participation is declining and consumption has a high share of GDP, protectionist help for struggling producers and workers is more sensible,” he wrote. “The main problem for the U.S. is not that protectionism will blast consumers, since their buying power is currently high. It is that the domestic economy is so large that even dramatic changes in trade policy do not have much impact,” he concluded. Trumponomics favors bilateral trade deals over multilateral ones. President Trump was quick to withdraw from the TPP (it was one of his first executive orders), and has begun renegotiating NAFTA with Canada and Mexico. The administration has not formally ended negotiations on TTIP, but is clearly not enthusiastic about that deal either. Renegotiating NAFTA will prove even trickier. After the 2016 election, GIS Guest Expert Dr. Andrew Selee wrote that Mr. Trump’s determination to rework the deal was the “greatest concern of the Mexican authorities” at the time. “The Mexican government will have to think strategically about what concessions it is willing to make. It will also need to coordinate with the Canadian government to strengthen its hand in what could otherwise turn into a very dangerous negotiation for Mexico’s economy,” he wrote. In December 2017, President Trump scored the biggest win of his presidency with the passage of his Tax Cuts and Jobs Act (TCJA). The centerpiece of the reform was the slashing of the U.S. corporate tax rate from 35 percent to 21 percent. The law also lowered tax rates for individuals, doubled the standard deduction and expanded the child tax credit. As early as February of that year, Professor Colombatto had predicted that the Trump administration’s real bet was on tax cuts rather than the protectionism that was worrying many. “If the Trump administration manages to implement the fiscal-policy side of the president’s program (lower corporate taxation), much of the protectionist talk will remain mere chest-thumping,” he wrote. In December 2017, just before President Trump signed the tax cuts into law, Prince Michael set out a differentiated view of the new legislation, saying criticism of the legislation “does not appear to be fact-based, but rather subjective, mainly emotional and ideological.” He pointed out that while critics claimed the corporate tax cut would result in dividend payments for rich stockholders, the reality was that small and medium-sized firms would benefit greatly, and would use the extra money to invest. Though the reform would result in a onetime addition of $400 billion to the $20 trillion national debt, increased revenue is projected to fully cover that in about a decade, he said. The larger issue regarding U.S. debt, he noted, was not the tax cut, but Washington’s ever-increasing spending, which is projected to increase by $10 trillion over the next 10 years. GIS Guest Expert Lars Christensen noted a few weeks after the 2016 election that Donald Trump and the U.S. Federal Reserve were turning out to be strange bedfellows. Despite Mr. Trump’s criticism of loose monetary policy under then-Federal Reserve Chair Janet Yellen, it was clear that markets were not expecting aggressive interest rate hikes. And restraint on the side of the Fed would help raise aggregate demand in the U.S. Moreover, President Trump’s planned spending, especially huge outlays on infrastructure, “would allow the Fed to raise interest rates without really tightening monetary conditions,” wrote Mr. Christensen. As it got closer to the time for the Fed to begin raising rates however, speculation rose that it was aiming for the so-called “natural” interest rate. Professor Colombatto suggested that the Fed could be seeking cover in this misleading term, “as a way of letting people know that a new target is being adopted and that this new target is less open to public discussion.” He continued: “[T]he Fed may be anxious to keep ample discretionary power and resist pressure from outside,” since the Trump administration would resent an overly strong dollar, as hurtful to U.S. exports and domestic producers trying to fend off foreign competition. In May 2017, Dr. Martin analyzed the effects of the Fed’s exit from quantitative easing. “Some economists worry that reducing the Fed’s Treasury holdings will push up yields and the costs of government debt service, although others say that would only give President Donald Trump’s administration further incentive to cut spending,” he wrote. However, he said, a tighter monetary stance would attract capital flows to the U.S. and strengthen the dollar, which in turn could hurt competitiveness and exports. “However, these negative effects could at least be partially offset by Mr. Trump’s planned corporate tax cuts,” added Dr. Martin. 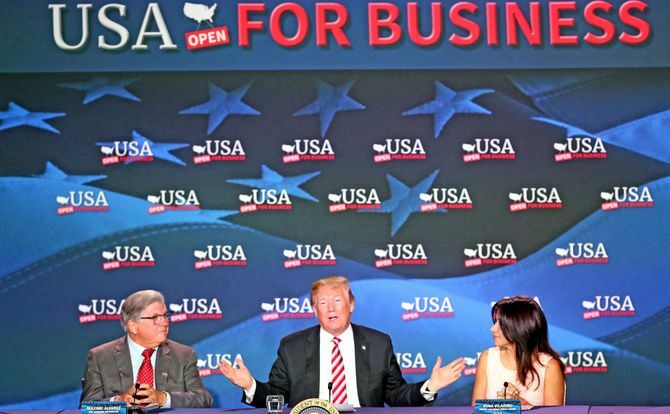 While President Trump’s tax and trade initiatives have received the most attention among his economic policies, GIS Guest Expert Diane Katz pointed out that the administration has overseen a regulatory revolution, significantly easing the burden of red tape on U.S. businesses. For example, the White House withdrew 635 previously listed rules, rendered another 244 inactive and delayed 700. President Trump has also committed federal agencies to cutting future regulatory costs to the private sector by some $9.8 billion. The Trump administration also issued two-thirds fewer regulations (1,209) than the administrations of Presidents George W. Bush (3,233) or Barack Obama (3,356). The number of “major” rules (those anticipated to cost the private sector $100 million or more annually), numbered just 32 in President Trump’s first year, compared to 73 under President Obama and 51 under President Bush. Such changes could have a positive effect on the U.S. economy, since “independent estimates peg the private-sector cost of U.S. regulation at more than $2 trillion annually – more than is collected in income taxes each year,” wrote Ms. Katz. [T]he economic gains resulting from the industry’s development, and perhaps more importantly from the reduction in oil and gas imports, will give the new administration of President Donald Trump a longer lease on life. Achieving energy independence has been the aspiration of almost every U.S. president since World War II. … Thanks to the shale revolution, it could become reality under Mr. Trump. He added that this would strengthen U.S. influence on global energy markets, potentially allowing it to push down prices and imports over the long term, while attracting foreign investment to build new refineries and terminals and stimulate the economy. GIS Expert Frank Umbach analyzed the global impact of Trump’s “America First” energy policies, positing that the Trump administration’s support for fossil fuels could benefit Europe, leading to an influx of liquefied natural gas imports and loosening Russia’s hold on the European gas market. U.S. LNG will not surpass Russian pipeline gas as Europe’s largest source of gas imports, but its rise will strengthen, not weaken, Europe’s energy supply security. It will become an important counterweight to Russian pipeline gas and will add more liquidity, flexibility, transparency and bargaining power for buyers, which will all help push down gas prices.